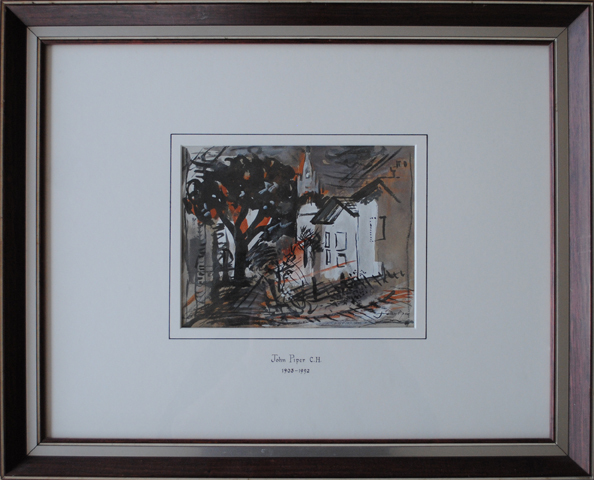 Born in Epsom Surrey, John Piper attended Epsom College before going on to study at the Royal College of Art in London. After dropping his early abstract style of painting, Piper began to study, draw and paint the countryside around him. He was particularly keen on the architecture of the townscapes especially the churches, depicted still in a style of an abstract manner using mixed media as well as oils. Piper was appointed an official war artist in World War 2 between 1940 and 1942 where his first painting was of the bombed Coventry Cathedral, the painting was described as ‘Britain’s Guernica’. One hundred and eighty of Piper’s works can be seen in the Tate Gallery and he has exhibits also in the Dulwich Picture Gallery and the Imperial War Museum.